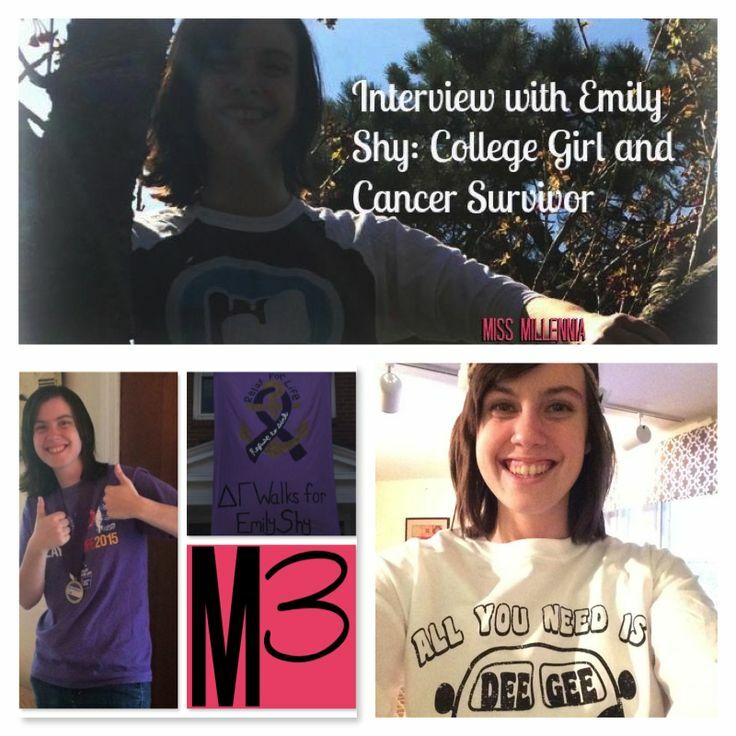 Emily Shy is an avid music lover, sorority member, follower of Christ, and cancer survivor. Despite her last name, she will be the first person to tell you that she is not at all shy. I am lucky enough to call this girl one of my best friends for the past six years, so I know that she is an amazing person. Miss Millennia readers, you will not want to miss this interview! Hi, Emily, tell us a little bit about yourself! I’m Emily Shy, I’m 20 years old, and I’m going to be a junior in college at DePauw University in Indiana. I’m currently a summer intern with the Missouri Baptist Convention, and I work at my church, ’cause Jesus is awesome. I can sort of juggle. Tell us more about your college life. What are you involved in? This past year, I was a co-leader for a freshman bible study and the prayer group and bible study group within my sorority. I’m a Delta Gamma. I am also on the exec board for a nonprofit called Bagos, which is the company name for our Coffee and Christ organization on campus. How has being in a sorority shaped your college experience? First off, I definitely stepped on my college campus and thought there was no way I am ever going to join a sorority. God was like, I love it when you tell me what I am and am not going to do. I was invited to two events at Delta Gamma. The first event was make-your-own pizza night. I remember being there, eating dinner with all the girls, and we ended up talking about Disney movies. I felt like I wanted to do life with these people. I was so welcomed. After those two events, they asked me to be a part of the sorority and I accepted! So I’m now a proud member of Delta Gamma. I feel like on campus, I really like our sense of Greek unity and how we support other people who are in the Greek community. We had Relay for Life on campus and my sorority had a giant sheet with my name on it. 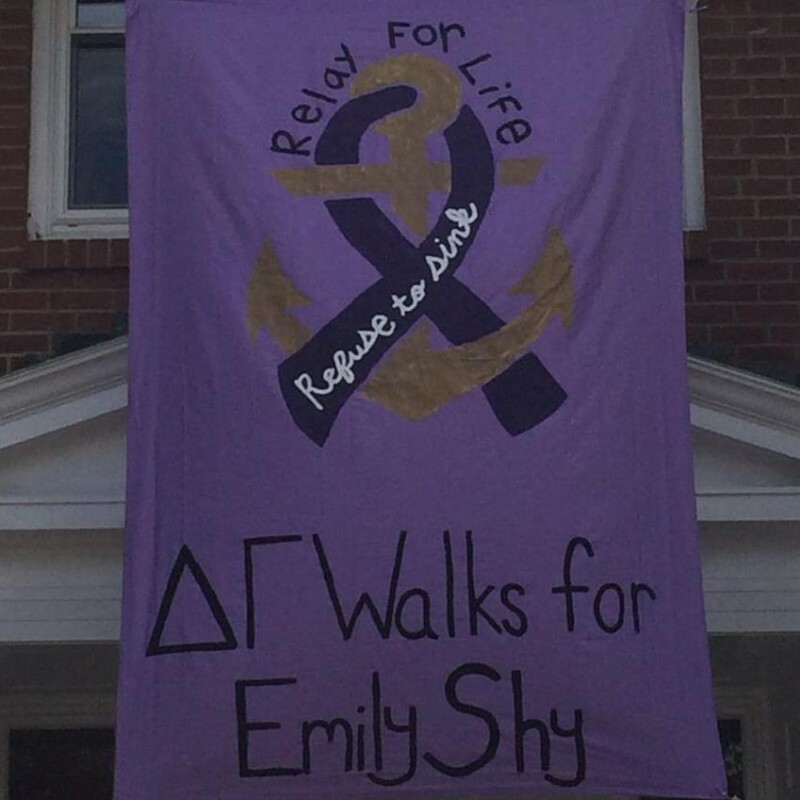 It said, “Delta Gamma walks for Emily Shy.” To have that many people supporting me is really cool. Let’s talk about your experience with having cancer. Tell us a little bit about your diagnosis and treatment. I was diagnosed in October of 2012, my senior year of high school. Around the 10th, I was going to sleep and I put my hand up by my neck, which was a total grace of God, and I noticed a little lump there. So I told my dad and mom. A couple days later, it hadn’t gone away. After talking to a doctor, I had an x-ray at Children’s Hospital and it showed that the lymph nodes in my neck and chest were enlarged. That meant I had to stay in the hospital overnight in case it affected my breathing. I’m not the happiest camper at this point, so I turned on the radio. I had never heard the song that was playing. The lyrics were: “I know who goes before me, I know who stands behind. The God of angel armies is always by my side.” It was this moment where I knew no matter what happens with all of this, God’s going to be with me and that’s all that matters. So that week, I was in the hospital for tests, and on Tuesday of that week the doctors sat my parents and me down and said that they were pretty sure I had cancer. It was hard for me to see it hit my parents, so that was the main day I really cried about it. I had a biopsy the following day, and on Friday my parents got a phone call confirming the news. I was sleeping, so they told me the next morning that I had been diagnosed with Stage 3 Hodgkin’s Lymphoma. The next day, I turned 18 and the day after that I started chemo. I did about four or five months of chemo and then did 14 days of radiation. By the point that my parents told me, I kind of already knew. One of my first thoughts, when I was going through the tests and things, was that I was frustrated that no one would address the elephant in the room. No one would say that word. It kind of freaked me out at first, especially for my family, and especially when I hadn’t been officially diagnosed yet. Because with any cancer there’s always the risk that you could, you know, die. I tried to focus on how I’ve claimed Jesus as my Lord and Savior. If this is what He has for me, then that’s what He has for me. Not that God was like “here, you get cancer,” but cancer is a thing that’s here and He’s going to take care of me through it. What was the hardest part about battling cancer? One of the hardest parts of treatment was Wednesday nights of my five-day chemo weeks. By Wednesday night, I already had three days of chemo and I still had to go back for two more days that week. It was just the worst. My sleep schedule was off because I had to take medicine every three hours, and it was harder to eat because the idea of food was just disgusting. I just felt like that night was never going to end. The worst part generally was seeing how it affected other people. I didn’t see a lot of it—there are still things I’m finding out about now. Telling people was awful. Right after my parents told me my diagnosis, I went out to lunch with most of my closest friends for my birthday. I didn’t tell them until the following day because that’s just the worst. There’s no way to slide that into a conversation. Normally when people say “What’s new?” that’s not what they’re expecting, and you don’t really know if you can do that to someone. What was the best thing that happened to you during this time? The best thing for me was seeing everybody come around me. All over the place, people were praying for me. I received so many cards and texts. There’s a moment at the end of the movie Its a Wonderful Life when George Bailey gets to see all of his friends show up and be there for him. He sees that he did make a difference in the world, that people care and he matters. It was cool to see that God could use my one little life to make a difference. How do you feel you’ve grown as a person through this experience? In one respect, it grows you up pretty fast. There are some people who walk onto my campus freshman year and they’re not the same 18 that I was. I feel like I got a semi-expediated process. There are these moments where I wake up and thank God I’m alive. Sometimes I forget, but I’m always reminded that this life is such a gift. I’ll walk out the front door and look up at this big sky full of stars and I’ll be like oh right, God can handle all my problems. You have to value the moments because you never know what could happen. You recently hit the two years in remission mark (Woo-hoo!). Can you tell us how celebrating that felt? I’m so excited. It’s so great to keep putting years between me and that. I trucked through it and then processed everything after. It’s safer to process the farther away it is. I got to have a party at my house, which was really awesome. There were friends from college, high school, and church. It was nice to have this mixture of people come together. How do you feel you’ve continued to change in these past two years? I was talking to one of the girls I was in the clinic with about how you forget things that happened during treatment. I feel like you end up blocking a lot of it out during the process because it’s so difficult and you just have to get through it. I’ll get pulled back to different things that I hadn’t remembered. To a certain degree, you have to get through it with a smile on your face because everybody’s watching and trying to get you through this. 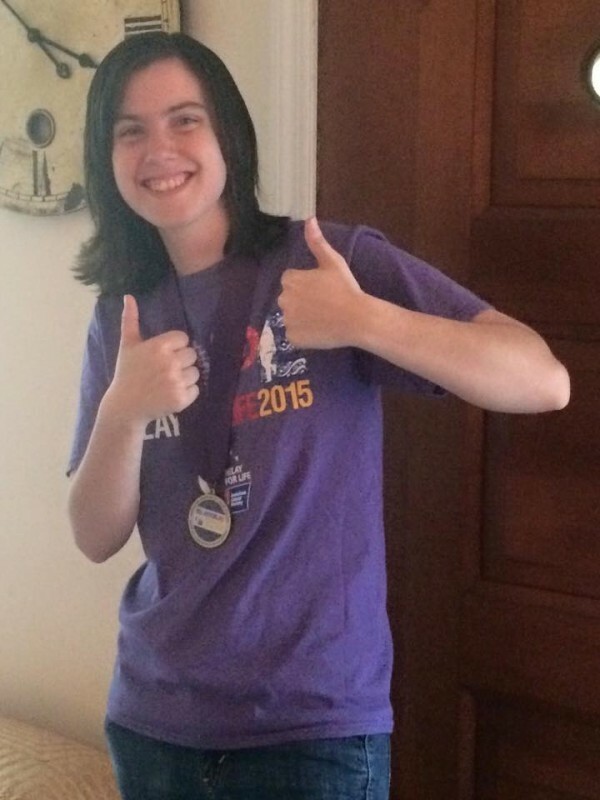 When I went to Relay for Life at my school this year, I got to speak and I did a survivor lap. I did a couple more laps afterwards and at one point I was walking by myself. I got to have this moment of reflection and just cry for me, cry for what I went through. And it’s not like oh woe is me, but this was a traumatic things that happened. To have that moment in a place where no one was looking to me to be ok was very healing. What are some words of wisdom you’d give to Millennials who have just been diagnosed with cancer? First off, trust God. He’s the one thing that never changes in the midst of everything being crazy. He always listens, and he always understands, which can be difficult to find. Another thing is let people help you. I didn’t want to accept help, because you hold tightly to the things you can still do. But sometimes people ask if they can help because they need to feel like they can do something. Have genuine people in your life who you can be real with so you don’t have to act strong all the time. I love hearing other people’s stories and getting to walk with them through life. I get to pray and cry with them and be there. I would love to be involved in anything where I see God’s heart. Any opportunity to help someone else. I don’t know what God is going to manifest that into in the future. My fantasy job for the longest time was to be a singer and write my own lyrics. I love writing rhyming poetry-type things and I love singing. But I don’t know if God is going to do anything with that or if I’ll go in another direction. I don’t really know where I’m going, but I’m loving the journey. Thank you so much to the wonderful Emily Shy! Be sure to follow her on Tumblr.